This summer, hundreds of thousands of us Brits are getting sunburned in droves. That’s hardly surprising in a way. We often get so little sun in this country, it’s only natural that so many people are underestimating it! Now, one of the key reasons that so many people is because they’re applying sunscreen improperly. Here’s how to avoid making those same mistakes! Theoretically, using sunscreen with a Sun Protection Factor of as little as SPF 15 should be enough to shield the worst of the sun’s rays. Unfortunately, as many of us are finding out, in practice that’s often not enough! In reality you need at least SPF 30, and preferably as much as SPF 50. Though the warmest weather has started to slightly level off recently, the sun is still bright and hot enough to cause your skin some serious damage. The big mistake a lot of people make is not applying enough of it and/or applying it too thinly, which limits its effectiveness right off the bat. While there are some great options for sunscreen (like our own Heliocare range) on the market, it can be easy to take their effectiveness for granted. They will provide your skin with a decent level of protection, but it’s still important to pay attention to when, where and how you’re exposing yourself to UV rays. Basically, the truth is that sunscreen needs to be applied generously to properly work. What a lot of people don’t realise is that SPF ratings are based on the assumption that a 2mg blob will cover 1 square centimetre of skin. That’s about 6 teaspoons to cover the body of an average adult. And really, you’ll want it to be a factor of SPF 30 or more. For maximum protection, apply more than half a teaspoon to each arm, your face, your neck and your ears. (We’ve all seen people with sunburnt ears!) Meanwhile, you need to apply more than one teaspoon to each leg, your chest and abdomen. You can probably already see why most experts say that in order to get maximum protection from sunscreen, you really need someone to help. 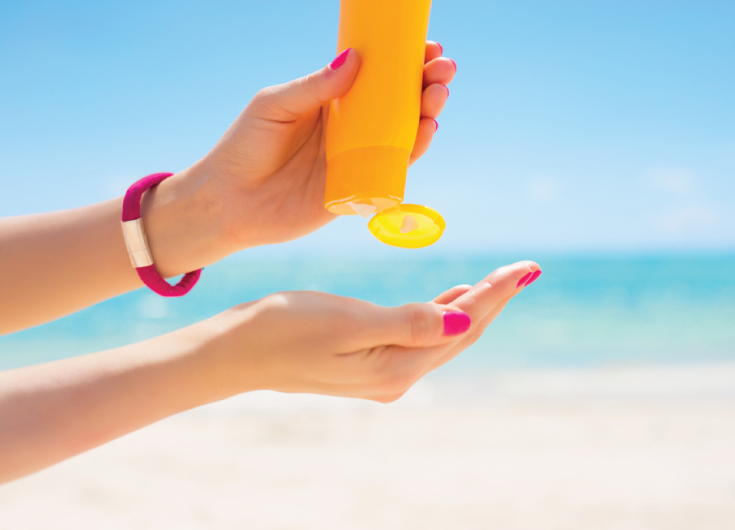 Don’t make the most common mistakes with sunscreen! People often miss the sides of their neck, the temples and the ears. Chances are that you’ve been one of those people, at least once! Make sure to cover all areas of your body, even if you’re after a ‘golden tan’. It might make you look good, but your skin’s health always comes first! Similarly, the British Association of Dermatologists advises leaving it at least 15 minutes to half an hour before going out in the sun, so that you give your sunscreen a chance to dry properly. Don’t forget to top up shortly after going outside, especially if you’re planning on something UV-intensive like sunbathing. The manufacturers of most sunscreens recommend reapplying it every two hours, and immediately after swimming. This last one is a big mistake that thousands of British tourists make every year. You might read on the side of some bottles that the lotions are ‘water resistant’, but don’t take their word for it! If in doubt, reapply again. When it comes to the health of your skin, it’s always better to be safe than sorry. In fact, here at AP Skincare, your skin’s health is our top priority. That’s why we offer such a huge range of skincare treatments right here in Blackburn, including derma facials and chemical peels to revitalise and tone your face. Why not visit us at our site in Blackburn, or give us a call on 01254 297 000 to see what we can do for you?